I was a brand new mom trying to figure out what being a mother was all about. I was navigating motherhood without a map, charting waters I was unfamiliar with. Spending time with a baby all day long was unlike anything I had ever done before. Changing diapers, nursing Lily, and laundry filled my day. Tummy time only lasted so long with Lily. One day, when Lily was about three months old, I wracked my brain as to what I could do with her to pass the time. Out of desperation or boredom, I’m not sure which, I sat her on my lap, grabbed Barnyard Dance by Sandra Boynton, and started reading aloud. I got through about three pages before Lily stopped paying attention and demanded the book to chew on. Every day, I read a little bit more and a little bit more, until I was able to read the whole book. All ten pages. Reading! Reading was something else I could do with my baby during those long hours at home! 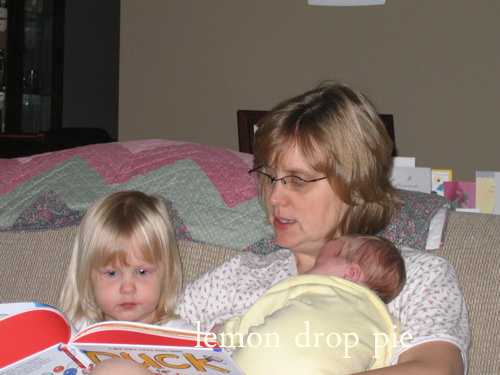 I read with Emmy when she was even younger. We were barely home from the hospital when Lily demanded I read to her, and therefore, to Emmy. After one of Emmy’s well baby check-ups, Lily embarrassed the heck outta me by throwing a temper tantrum when I couldn’t finish a waiting room book I had started reading to her while waiting for the doctor. One of my wishes is to pass on my love of reading to my girls, but she was carrying it a little overboard. 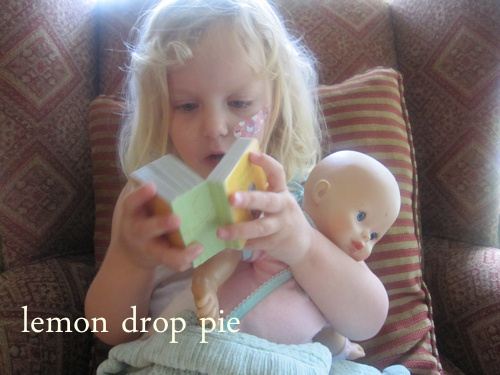 Emmy memorized the nursery rhymes in this set of board books and I caught her reciting this one to her doll. These chunky books were perfect for her plump little toddler hands to hold. Yes, that is a Hello Kitty Band Aid on her cheek. No, she does NOT have a need for that bandage to be on her cheek. This picture was taken during her Band Aid phase. When reading, it is necessary to find a comfortable spot. An empty laundry basket will do just fine. This moment lasted all of 2 seconds. Emmy is famous for her temper tantrums. That tantrum Lily held in the doctor’s office? NOTHING compared to the tantrums we have had to endure from Emmy. Just a few weeks ago, Emmy had another temper tantrum. But this…was different. A box came with books for Lily, and none for Emmy. Lily had been dying to get her hands on the newest Magic Tree House book, Abe Lincoln at Last, so I ordered it for her along with the non-fiction companion as soon as it was available. Lily was thrilled when it came, and Emmy…threw a tantrum. Not so much a tantrum, but more of a whine fest. Because she wanted a book, too. To me, lover of books, this seemed understandable. Emmy and I hopped online and looked for a book. She is now in a kitty phase, so she picked Bad Kitty Gets a Bath and Bad Kitty Meets the Baby, both by Nick Bruel. As soon as we received the books and opened the box, I thought we were in for another tantrum. The first Bad Kitty is a picture book; these Bad Kitty books were chapter books. Emmy is not into chapter books. Lily, however, knows what makes her sister tick, and soon convinced Emmy that these books had too many pictures to really be chapter books. Even though that’s exactly what they are. And I realized that my wish, one of my fondest wishes, has come true. Lily and Emmy love to read. ← Take This Fun Survey! There is no greater gift than the gift of love. Well reading comes in a close second. Reading together creates precious moments and life long readers. My son is now 32 years old and still an avid reader. It all started with that book with the cardboard pages. Awww! What a dream to have realized. Loving to read is such a lasting gift. Beautifully stated, friend! Yay for readers! 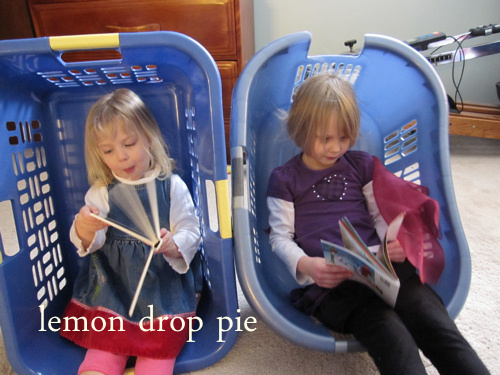 Especially readers in laundry baskets! My chickie will sit up in her bed for HOURS reading a stack of books every night. And I totally get it, because I can’t go to sleep unless I’ve read for a while, too! Reading before bedtime is a must! But then it's hard to turn out the light…. That's lovely! And a wonderful love affair sure to last a lifetime! I hope so! Time will tell…. What a beautiful memory and story you shared. My parents didn't read and I didn't read much. I read to my children but not in the way that I will read to my grandchildren someday. I love books, I buy books all the time. I find it hard to take time away from life (computer) to read. I am trying to change my ways. Books are wonderful and take your imagination to awesome places. My time at the computer takes away from my reading too, Debby! But I joined a book club, so now I'm "forced" to read at least one book a month! Abby loves those little board books and I LOVE that she reads them to me! Her memory for each story we read is amazing and each time I read to her, she then reads it back to me. Like you, I am reading to Lilly at a much younger age then I started with Abby but I love when the three of us can cuddle together and read! Kids aptitude for language is amazing, isn't it? I love watching them soak up words! Some nights, I'll get into my pajamas at the same time as the girls, and we'll snuggle in my bed reading books. We call that having a pajama party! The girls in their laundry baskets remind of these cool swivel chairs in the student union when I was in college. I loved sinking into one of them, blocking the world with the sides that covered and hid me, and losing myself in a book.